Any trainer will tell you that training people can be a lot more challenging than training dogs. One of the most troublesome aspects in working with people is gaining and keeping compliance. You may have an excellent training program, but if your clients don't follow through and practice at home, the result will be a dog that is not as well trained as possible and ongoing excuses as to why no or very little practice has taken place. In this seminar, you will learn how to motivate your clients to follow suggestions and to keep working with their dogs. 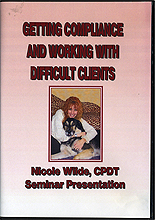 Nicole Wilde, CPDT-KA (Certified Professional Dog Trainer) is the author of nine books, writes columns and articles for various magazines and newspapers including Modern Dog Magazine, and has hosted the Dog Talk radio show. She co-stars in the DVD Train Your Dog: The Positive Gentle Method and guest stars on The Dog Whisperer (with Paul Owens) DVD. Nicole is on the Advisory Board of the Companion Animal Sciences Institute, an accredited distance learning college that provides certificate courses and diploma programs of study in professional dog training, behavior consulting, fitness and nutritional sciences. She is a professional member of the Association of Pet Dog Trainers (APDT) and a popular speaker at their national conferences. Nicole also teaches seminars and workshops around the country and internationally. Nicole has worked with all types of canines, both domestic and exotic (specializing in wolves and wolfdogs) as a trainer (and rescuer) for over twenty years. She has also worked with the Los Angeles city shelters, and was Executive Director for a rescue center for wolves/wolfdogs and Pit Bulls. Nicole trains dogs and their owners through her company, Gentle Guidance Dog Training, in Southern California.